Victoria Gulbrandson, Kate Penhallow and Lily Wiggins recently qualified for the MathCON Championship in Chicago. “We are so excited for the fifth grade students who have given 100 percent every day in class. Their hard work has paid off. Attending the MathCON competition will be a rewarding experience for them, and they will do a fantastic job representing Prairie Creek Elementary School,” said Cynthia Eaton, fifth grade teacher. MathCON is an online math competition for students in grades 5-12 with grade-level specific timed tests of 45 multiple-choice questions in 45 minutes. Students from any school in the United States, including home-school students, take the test at their school under the supervision of their own teachers. Only 576 students out of 49,685 contestants qualify for the championship event. 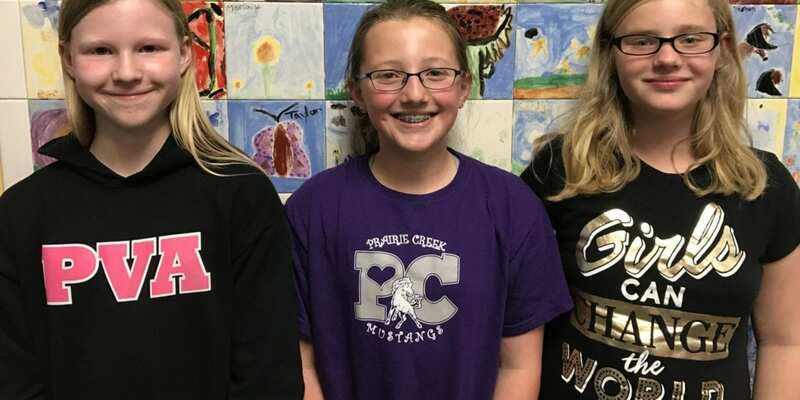 All three Prairie Creek Elementary School students scored in the 99th percentile. The MathCON 2017 championship will be held at the University of Illinois in Chicago on April 22, 2017.